'The Orville' Questionable Dessert Coating VS *-- TOTAL HORSE MANURE --*!! IMHO Doka as a component of TV, flicks, you name it and all around to paraphrase "The Schnozzola" Jimmy Durante, if not everybody at this point more's the question of who and what isn't wanting in on the politic act these days?? That (not) said? Far's show biz 'directives' go, 'ST Discovery' IS a PURE and PRIME example of a patently politicized Sci Fi series; far less Trek than blatant orgasmic SJW Drek, its baked-in heavy handedness is absolutely anvilicious. It's one thing to serve up ice cream with social justice syrup, but AS a turn-off it's not AS NOXIOUS as all of STD!! Far from a fun space-faring treat, nothing I've seen tells me IT's dishing out anything but complete and utter CRAP. "The Orville" Was A Rerun This Week? What Gives? Not wanting to air a new episode against the MLB playoff game would make sense - Still, could their be more reason for why FOX pulled the rug out at the last minute? Instead of a hit, were their worries it might 'strike out' big time with the fan base? Will it air eventually if not sooner, or be indefinitely shelved for 'Major League' "re-tooling"? Who's on First? What's on Second? I Don't Know's On Third?? Stay turned! Re: "The Orville" Was A Rerun This Week? What Gives? While I dunno if there was any purposeful 'bait and switch' strategy involved in what happened this past week, if indeed a pattern of rug pulling emerges I'd be more inclined to believe so. 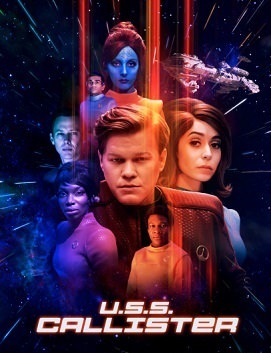 In episode 4 of the 4th season of "Black Mirror," the dark Emmy-winning sci-fi anthology, viewers are invited to follow the story of a bemused captain and his trusty Space Fleet crew exploring the galaxy and the dangers of unknown alien planets. Even as the hilariously retro promo gives a glimpse of its influence, there's no hint of the severely sinister twist on Star Trek's mythos 'USS Callister' is going to have. Somehow, that just makes things more unsettling. 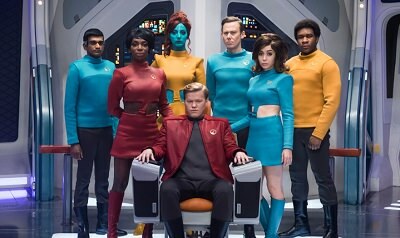 A hoot to watch it will be but USS Callister will also probably fock you up the way the best Black Mirror eps tend to do. I did watch The Orville , It was really good! Was it just an "accident" or has it just gotten better? Again "The Orville " was a good watch! Watched Roswell, New Mexico, I thought it was more for the youngish crowd, done in the "Vampire " venue, I will try it again. STD was to be on CBS last night, could't find it, and was not listed on my TV listing App. .
By far the best is "Project Blue Book" it is loaded, with "Goodies"! One thing to think about, is that Hynek, was hired as a Civilian Observer, the Military was and is always in control of "information/dis-information. Hynek was an Astrophysicist, Astronomer. He was "Advisor" on two other Military run projects, before he ever got to Blue Book. It's a matter of Principal, I will not pay for streaming CBS All Access when there's already CBS network on my Cable. And it really pissed me off when they thought they could rope in ST Fans with a new Star Trek Series. Shall we have a Thread dedicated to The Orville? I love that show, glad it got renewed for a second season!